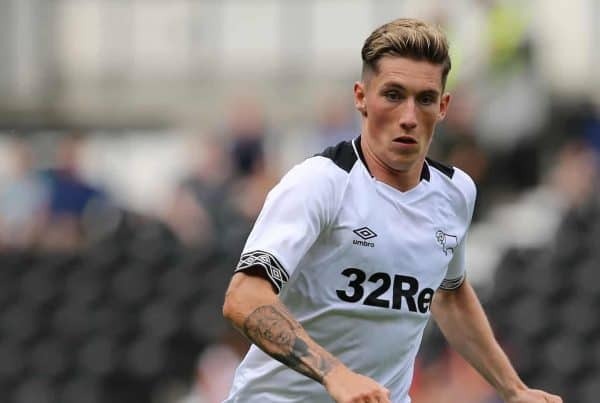 Harry Wilson brought his goal tally on loan at Derby County to 12 as he inspired his side to a 2-1 win over Reading, with Ovie Ejaria starting opposite him. After a spell out with a groin injury, Wilson returned to the Rams lineup to score one and assist one in a dramatic FA Cup victory over Southampton in midweek. The Wales international then kept his place in Frank Lampard’s side for the visit of Reading, where he faced off against another Liverpool loanee in the form of Ejaria. Ejaria, whose spell with Rangers was brought to a premature end in December, joined the Royals earlier this month and has immediately taken up a key role under Jose Manuel Gomes. But the midfielder suffered a first defeat for his new club, as Wilson ran rampant again at Pride Park, drawing high praise from Lampard. Derby opened the scoring on Saturday through Duane Holmes, who latched onto Wilson’s through ball behind the Reading defence and strike past Anssi Jaakkola after just three minutes. And Liverpool’s No. 59, wearing the No. 7 for his current club, doubled the lead five minutes before the break, this time through fortuitous circumstances. After a bright one-two with Martyn Waghorn, Wilson opened fire and ultimately beat Jaakkola through a big deflection. Ejaria himself laid on an assist to see Sone Aluko reduce the deficit, pouncing on Derby centre-back Fikayo Timori to feed his new team-mate, but it wasn’t a standout afternoon for the 21-year-old. Deserving of focus, however, is Wilson, who has now scored 12 and assisted four in 26 games for the Rams, and though his goal contributions are impressive, Lampard highlighted his all-round impact in his post-match press conference. “There’s a lot of talk about Harry and early in the season he was hitting spectacular goals,” he told reporters. “But what he’s done which has really impressed me in the last two months is really up his game generally. 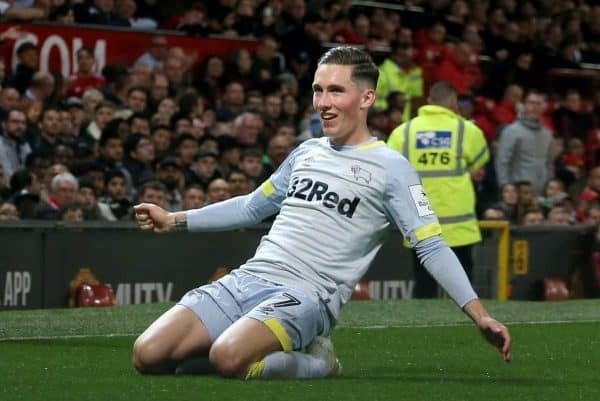 “Everything about his game is positive, he wants the ball, he’s creating, he’s scoring so it’s not just the fantastic goals that Harry Wilson is; he’s a player who is developing fast and I’m loving watching him play at the minute. “He’s a threat, he works hard, he wants to play every minute of every game. 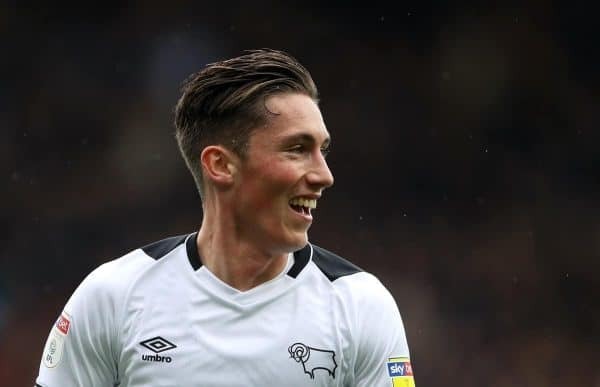 The real positive is that, at Derby, Wilson is able to play as often as possible, with Lampard relishing working with the versatile young midfielder. And the manager revealed earlier in the week that the recall clause in Liverpool’s agreement has now expired, ensuring there is no prospect of the 21-year-old making an early return to Merseyside. This is certainly the right decision, as Wilson is excelling in the Championship again this season.